Green fluorescent protein (GFP) is a 27 kDa protein derived from the jellyfish Aequorea victoria, which emits green light (emission peak at a wavelength of 509 nm) when excited by blue light (excitation peak at a wavelength of 395 nm). GFP has become an invaluable tool in cell biology research, since its intrinsic fluorescence can be visualized in living cells. GFP fluorescence is stable under fixation conditions and suitable for a variety of applications. GFP has been widely used as a reporter for gene expression, enabling researchers to visualize and localize GFP-tagged proteins in living cells without the need for chemical staining. YFP differs from GFP due to a T203Y mutation; antibodies raised against GFP should also detect YFP. 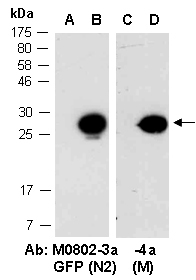 Mouse monoclonal antibodies were produced by immunizing animals with a GST fusion protein containing the N-terminal region of GFP from Aequorea victoria (Jellyfish). Antibodies were purified by Caprylic Acid- Ammonium Sulfate precipitation. Supplied in 1 x PBS (pH 7.4), 40% Glycerol, 0.02% Thimerosal. Store at -20 °C. Stable for 6 months from date of receipt. This anti-GFP antibody recognizes the enhanced form of GFP (EGFP), GFP and yellow FP (YFP) made by Aequorea Victoria (Jellyfish). Abs against 2 distinct regions of GFP at RT for 2 h.